Keto Italian Meatballs are made with the same flavors as traditional Italian meatballs, but with only 2 carbs per serving! Whether you bake them or fry them, you are sure to enjoy this classic favorite! Meatballs are such a classic Italian recipe, it would be a shame to not be able to enjoy them. 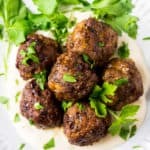 This recipe for Keto Italian Meatballs is the result of making a few simple modifications to a traditional meatballs recipe. 5 of these delicious meatballs have only 2 total carbohydrates and they are 100% gluten free! You can enjoy these meatballs on their own, with a side of vegetables, mixed into your favorite low carb “pasta” dishes, or even as an appetizer/party food! Double the recipe and you can freeze some for quick meals on busy weeknights as well! 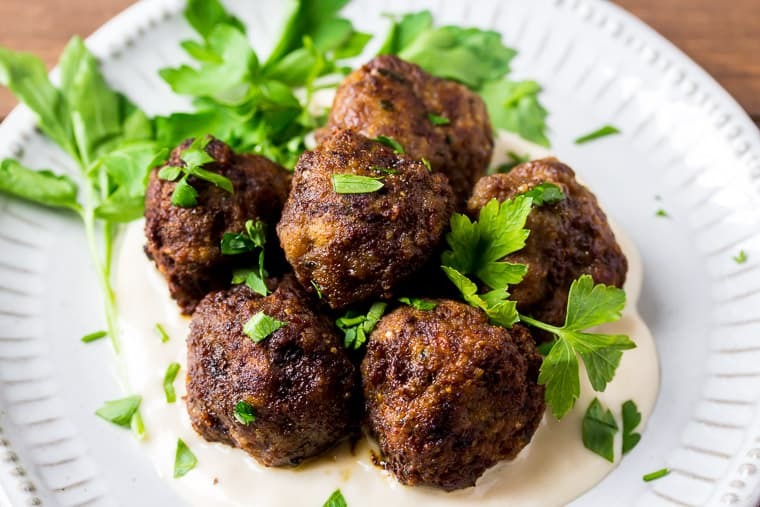 This keto meatball recipe uses blanched almond flour instead of bread or breadcrumbs. This keeps the recipe suitable for those who are gluten free or on a low carb diet. There is no onion in this recipe to lower the carb count even more. However, if you want to include onion, dice up a small onion and mix it in before rolling out your meatballs. Note – If you are counting carbs, you’ll need to adjust the nutritional information in the recipe card below. You can bake or fry these meatballs. The recipe card below includes directions for both methods. Meatballs can be made ahead of time and stored in the freezer for easier meal prep on busy weeknights. Preheat your oven to 400°F, if baking the meatballs. If you plan to fry the meatballs, skip this step. 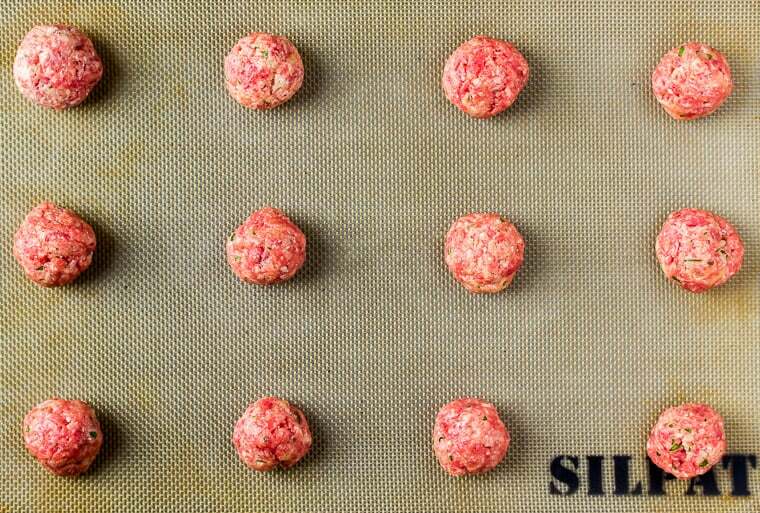 Line 2 baking sheets with aluminum foil or Silpat mats if you are baking the meatballs. Mince the garlic and parsley. Add all of the ingredients (except for the oil for frying) to a large mixing bowl. Using your hands, mix everything together until just evenly combined. Do not over mix. Scoop out 1 tablespoon of the meat mixture and roll into a firmly packed ball. If baking, place the meatballs on the baking sheets about 1-inch apart. Or, if frying, place the meatballs on a plate until you are ready to fry them. To BAKE: place the sheet pans with the meatballs into the oven and bake for 20-25 minutes until cooked all the way through. 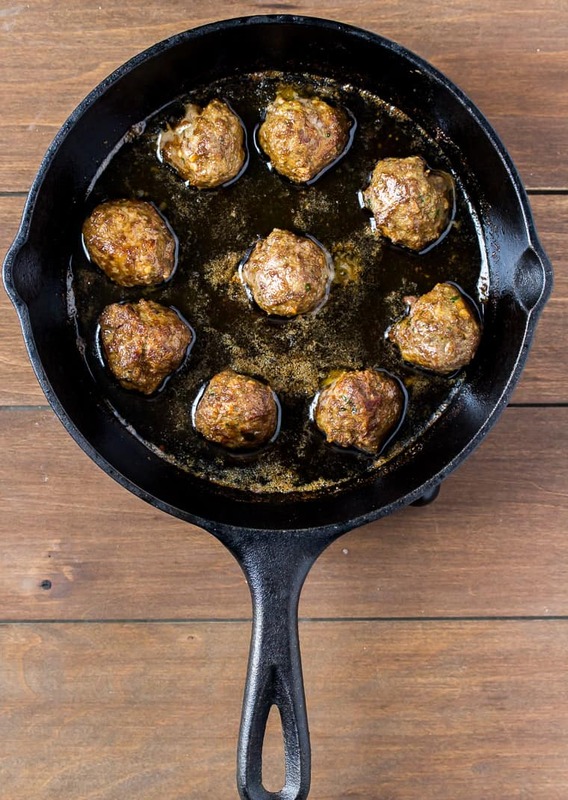 To FRY: add olive oil to a frying pan until it comes up to about 1/4-inch the height of the meatballs. Heat over medium high heat. Add the meatballs, turning often, and fry until cooked through, about 4-6 minutes. Remove with a slotted spoon to a paper-towel lined plate. Serve these Keto Italian Meatballs as is, or with the keto-friendly sauce of your choice. Top with extra fresh minced parsley, if desired. A 50/50 mix of ground beef and ground pork also works great for this recipe. You can add a little diced onion to these meatballs, but it will increase the carb count, so keep that in mind. 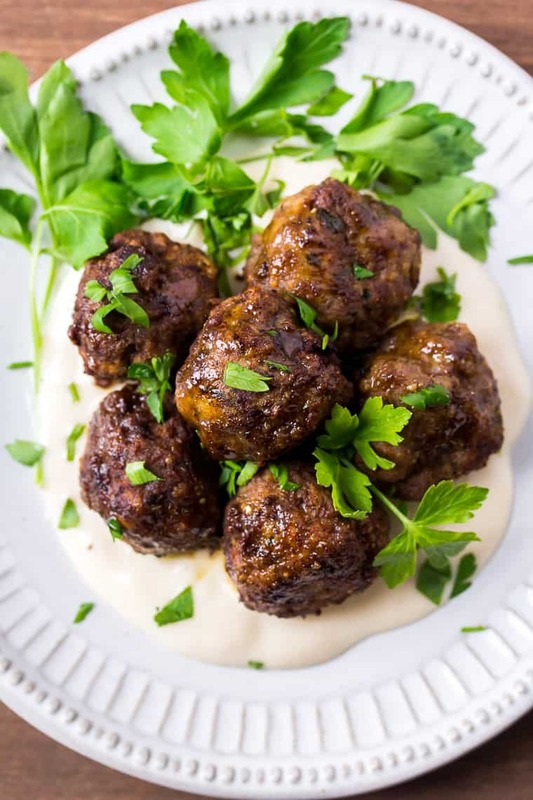 Serve these meatballs with a Parmesan cream sauce, a keto-friendly tomato sauce like Raos, or a sugar free barbecue sauce (just be sure to check the ingredients to make sure they all fit within your particular diet). You can prepare uncooked meatballs ahead of time and store them in an air-tight container in the refrigerator. Cook within 2 days. To freeze uncooked meatballs, place them on a baking sheet in the freezer. Once frozen, transfer them to freezer bags or air-tight containers. Store cooked meatballs in an air-tight container in the refrigerator and use within 3-4 days. Freeze cooked meatballs in freezer bags or air-tight containers for up to 3-4 months. Love this Keto Italian Meatballs recipe? Follow me on Pinterest, Instagram, and Facebook for more! Keto Italian Meatballs are made with the same flavors as traditional Italian meatballs, but with less carbs. Whether you bake them or fry them, you are sure to enjoy this classic favorite! Line 2 baking sheets with foil or Silpat mats if you are baking the meatballs. Add all of the ingredients (except the oil for frying) to a large mixing bowl. Using your hands, mix everything together until just evenly combined. Do not over mix. 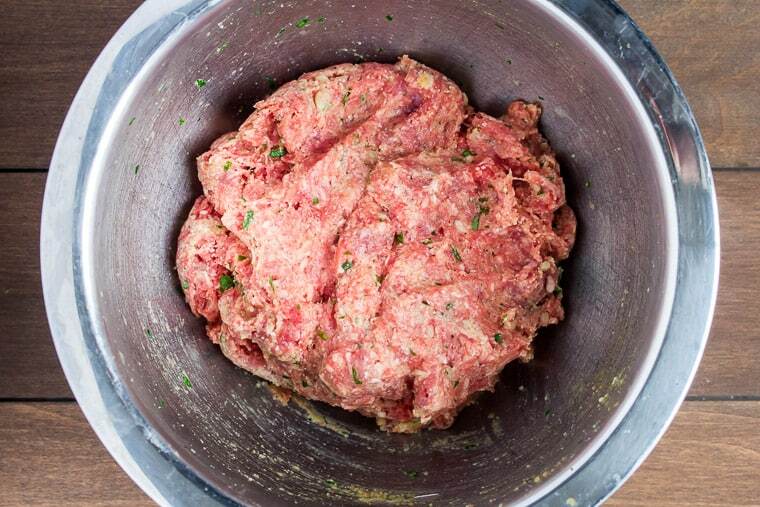 Scoop out 1 tablespoon of the meat mixture and roll into a firmly packed ball. If baking, place the meatballs on the baking sheets about 1-inch apart. Or place on a plate until you are ready to fry them. Repeat this step until you have made all of the meatballs. To FRY: add olive oil to a frying pan until it comes up to about 1/4-inch the height of the meatballs. Heat over medium high heat. Add the meatballs, turning often, and fry until cooked through, about 4-6 minutes. Remove to a paper-towel lined plate. * Nutritional Information is given as an estimate only. It does not include the values of any olive oil the meatballs may absorb should you choose to fry them.